2016 was an amazing year in WISCONSIN PREP THROWING! Especially for GIRLS! WIAA has been sponsoring HIGH SCHOOL GIRLS TRACK and FIELD for 46 years and within the last few years there has been a lot of re-writing of the history books, but nothing like 2016! 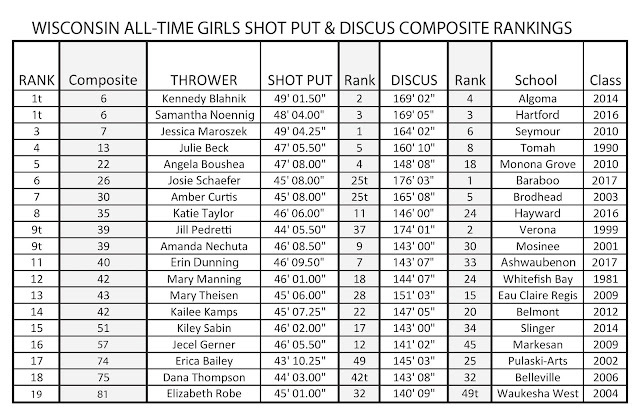 Here is the new 2016 version of the WISCONSIN ALL- TIME COMPOSITE RANKINGS for the GIRLS THROWING EVENTS. Of the thousands of prep girls who have picked up a shot put and discus in Wisconsin over the past 50 years, only 19 girls have throws that rank in the top 50 of BOTH the SHOT PUT and DISCUS events. The COMPOSITE RANKING adds each athletes rank on the top 50 ALL-TIME LIST in both events. The lower the score, the better the combined ranking. A HUGE congratulations to Samantha Noennig (Hartford), for moving up on the list to #1 ALL-TIME, tied with Kennedy Blahnik. Also, congrats to Josie Schaefer (Baraboo), Katie Taylor (Hayward), and Erin Dunning (Ashwaubenon) for adding their names to the list this year. Sam had made the 2015 list as a junior tied at #4. She used improvements in both her Shot Put and Discus marks in 2016 to move into a tie for #1 with Kennedy. Her 48' 4" Shot Put throw and 169'2" Discus throw rank her #3 in both events and give her a composite score of 6. What's more remarkable is that Sam tore her ACL in her right knee in October and had reconstructive surgery in mid-November, she was not expected to have a senior season at all. Congrats Sam! Josie had a remarkable 2016! Josie has been in the top 50 in discus since her freshman year climbing to #2 as a sophomore. Josie broke the #1 All-Time Discus throw mark of Jill Pedretti, with her 176'3" throw at the 2016 USATF Junior National Championships. But this list is about combined throwing prowess...after switching from the glide to rotational Josie had a breakout year in the shot put. Her 45'8" throw is a seven foot improvement over her sophomore year and moved her into a tie at #25 on the All-Time Shot Put List. Her composite score of 26 ranks her 6th all-time! All this with 1 prep season left. Katie improved in both events as well this year! Her 46'6" Shot Put throw ranks her #11 on the All-Time List. With a huge improvement in the discus 146' 0" (#24) in her senior year she has made the Composite List at #8 All-Time. Erin spent her freshman and sophomore year's as a great Shot Putter struggling to reach her potential in the Discus. So often young throwers develop one strong event and search for a 2nd. Well not only did Erin improve on her already impressive Shot Put accomplishments, moving to #7 all-time with a throw of 46'8.5". She showed great progress in the discus this year, her P.R. of 143'7" ranks #33. With a composite score of 40 she moves onto the list at #11. And she's just a junior too. As we continue to see massive improvements in the Girls SHOT PUT and DISCUS around the state, its important to pay homage to those that blazed trails and raised the bar! Peggy Seidler, Wausau '07, her throw of 140' 0" was bumped from the top 50 in Discus. She still stands #46 in Shot Put at 44'1"! How much have GIRLS pushed the standard forward? In 2003, my 2nd year coaching, Jenna Mahaffey, Madison Memorial '03 won the D1 State Meet with a throw of 42'6", her P.R. that year was 42'10.75" and ranked #29 All-Time. This year alone there were 10 girls who threw the Shot 43' or better! Thanks Jenna, Peggy and to all of the pioneers who continue to inspire the hard work it takes to throw far. 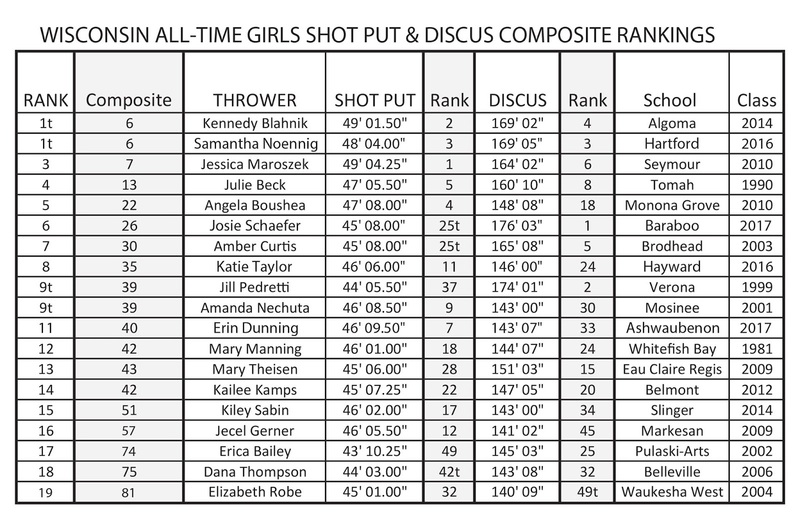 #50 Shot Put 43' 10"
See the WISCONSIN ALL-TIME TOP 50 LISTS in every Girls Event, carefully compiled by Mark Rongstad and now updated by Mike Krugel! Thank You! See the 2016 WISCONSIN GIRLS TRACK and FIELD HONOR ROLL, thoughtfully compiled by Dave Figi for over 20 years! Thank You! Going to need some time to edit the over 500 throws videos I took this weekend. As soon as I have them edited I will get more vids up on youtube and post them here. MTC YouTUBE - check it out here. Subscribe. Landon Ellingson, (SR.) Jefferson High School, goes double gold by adding the D2 SHOT PUT title to his discus title from the day before! Landon starting throwing with MTC in 7th grade, 6 years of hard work and dedication - what a great finish to your HIGH SCHOOL Career! Landon Zimmerman 6th, Jake Wendt 7th, Cole Eastlick finished 8th. 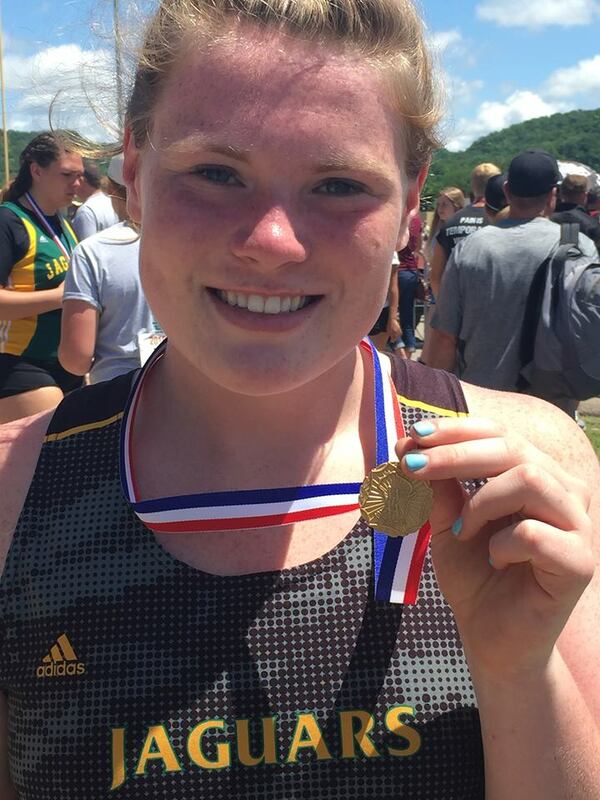 Congratulations to ERIN DUNNING (JR.) Ashwaubenon High School on winning the D1 Girls Shot Put Title. Erin was runner-up as a sophomore and turned in a great performance to win her first crown. Madison Throws Club throwers swept the top 4 spots in the Girls Shot Put.